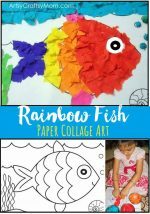 It’s time for another monthly craft challenge from the Kids Craft Stars. This months challenge was to create a craft based on a popular preschool children’s book – Lil P loves the book – Giraffes Can’t Dance and we decided to make a Dancing Giraffe Wall Art for her room with her favorite quote from the book. This story is about a giraffe called Gerald who can’t dance. At least he can’t dance very well. As a result, he gets teased by the other animals at the local ‘Jungle Dance’and he walks off alone into the jungle, lonely & sad. With the guidance of a wise and gentle cricket, Gerald learns to listen to the sounds around him and to his own body, and starts dancing to his own tune and all the animals are now in awe of him! The message of this lovely rhyming tale is that it is okay to be different and dance to the beat of our own drum. Directly Print Onto yellow card stock or draw your own giraffe. Make sure you keep all the limbs & tail separate from the body . Cut to shape and arrange the limbs as you want to place them. Add spots & odd shapes to make Gerald nice and spotty . Fill in with orange or Brown markers. The book has Gerald sporting orange spots but Lil P wanted brown. Roll a crepe ribbon and cut halfway to make grass. Stick them all together on the cardstock. Add your quote and Frame! Now when you shake the frame , the limbs & body giggle. Or you can manually move them too. Isn’t that a fun wall art to have in your room? 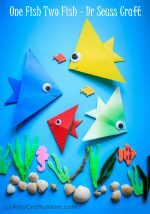 If you are looking for even more easy kid craft ideas that have been inspired by our favorite children’s books, be sure to check out the rest of The Kids Craft Stars to see what we have crafted for this month’s challenge! And keep up with the latest from The Kids Craft Stars by following our hashtag #kidscraftstars on Instagram! My kids think Giraffes can’t dance is so funny! This craft is perfect to go along with it. Thanks so much! Hi. I would like to do this project for VBS in July. Will you post the template for the giraffe? Thank you in advance. This is adorable! Is the giraffe template still available? I was unable to find it. Thanks so much! 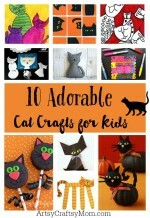 I’d love to make this with my Pre-K class. Where do I find the free printable? I just got this book for my kids this winter and it is so cute. I cannot wait to try out this with my daughter. What a fun book tie in. Is the giraffe template still available? I was unable to find it. I’d love to use this for a preschool DANCE storytime. lovely idea..but was unable to find the giraffe template.. can you please share it soon !! Just trying to find the template for Gerald the dancing giraffe. Hi! Wanted to do this for a group of 2nd graders but was unable to find the template. Thanks in advance! Hello! I really love this craft idea, but I can not find the printable. It is still available? I want to use this activity at my class! Thank you! Sorry. had to take the printable down for copyright issues.